Dr. J. William Langston, founder, CEO and Scientific Director of the Parkinson’s Institute in Sunnyvale, California addressed a packed banquet hall in Calgary, Friday, January 9th at the 2008 Donald Calne Lecture, hosted by Parkinson Society Canada and Parkinson’s Society of Southern Alberta (PSSA), and sponsored by Solvay Pharma. Dr. Langston brought up to date an audience of over 120, including attendees of the Parkinson Research Alliance meeting, on developments in Parkinson’s. Earlier in the day, Dr. Langston presented Grand Rounds at Foothills Hospital where he talked about the latest stem cell progress in Japan. Scientists are using skin samples to generate stem cells which could one day lead to the reversal of Parkinson’s. Special thanks to John Petryshen and his wonderful staff and volunteers at PSSA for all their help in making the event run smoothly. Researchers now know that, in Parkinson’s, the protein, a-synuclein, becomes toxic and destroys the cells when it does not fold properly. “This represents a huge shift in the thinking about PD and makes the area of protein folding an important therapeutic target,” said Langston. Dr. Langston cited many studies showing a link between the use of pesticides and herbicides and Parkinson’s. Over 50 published studies show an inverse relationship between PD and smoking, according to Dr. Langston. “If you smoked from the time you were a teenager, your risk of getting Parkinson’s is much less.” However, cigarette smoke has 4,000 chemical compounds, so finding the right one poses its own challenges, he cautioned. Coffee drinking also seems to reduce the risk of Parkinson’s. Dr. Langston discussed the long-standing debate about genetics versus environment and reviewed the studies of twins, both identical and fraternal which showed that the environment plays a role. “While genetics loads the gun, the environment pulls the trigger,” he said. Dr. Langston spoke about using the internet to gather research, citing 23andMe, the company that won Time Magazine’s #1 Invention of the Year award, as one example. 23andMe is embarking on a genome project where you “spit in a cup”, send it to a central location and six weeks later, receive a personalized genome that traces your genetics, where your ancestors came from and whether you will ever be an Olympic sprinter. It also can tell whether you are at risk for Type 2 diabetes and which diseases are high risk for you. This study has the ability to gather massive amounts of population information and could change the future of research. California recently passed into law new legislation which calls for all cases of PD to be reported in the State of California. According to Dr. Langston, both patients and doctors wanted this law. 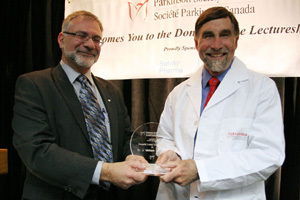 The Donald Calne Lecture was recorded and will be available soon at www.parkinson.ca.